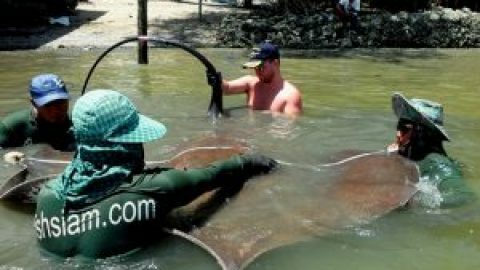 UK anglers Andy and Rob continue their monster fishing holiday at Palm Tree Lagoon and catch a monster Arapaima or Pirarucu of an estimated 150kg’s. After an early start the anglers arrived at Palm Tree Lagoon in search of yet more monster fish. Fishing with super sharp Owner hooks attached to strong fluorocarbon leaders the anglers cast livebaits towards a massive Arapaima which regularily surfaced out in the lake. The anglers also cast out additional Carp fishing set-ups in an attempt to lure one of the lakes elusive Giant Siamese Carp. With large predatory fish surfacing all over the lake the anglers moved slowly around the lake casting into likely looking areas. Andy soon hooked a good sized Redtail Catfish which charged across the lake on a deep powerful run. After a lively fifteen minute battle the Redtail Catfish was finally brought to the waiting landing net where it was scooped up in the folds of the net. The Redtail Catfish was estimated tom weigh 25kg’s and was released after a few trophy shots. Several other predators followed with Alligator Gar and further Redtail Catfish falling for the carefully presented livebaits. Late in the afternoon one of the rods being fished for carp screamed into life as an unseen monster fish ripped off with the bait. After winding down into the fish the rod was wrenched towards the surface as the fish moved away at a high rate of knots. A gigantic swirl formed on the surface of the lake as a massive crimson tail broke through the surface layers of water. The massive frame of an armor plated Arapaima rolled over in the margins revealing the true nature of the unseen monster fish. The Arapaima was clearly a large specimen of almost two metres in length and wildly thrashed its head in an attempt to rid itself of the hook. Another series of strong and powerful runs followed ripping yard upon yard of line from the tightened clutch. A thirty minute battle ensued which saw the prehistoric predatory entering a snaggy area under a fishing platform. Carefully Boy entered the water and cut and retied the mainline allowing the angler to regain control of the fight. The powerful predator once again powered off up the lake on another run hell bent for the aerators moored on the far side of the lake. Once again the Arapaima gained the sanctuary of the snag requiring the angler to slacken off the line. Yet again Boy entered the snags and retraced the path of the mainline, quickly rejoining the line to the rapidly departing predator. Several more minutes followed which saw the fish thrashing the water to foam in a final attempt to evade capture. Finally the Arapaima was brought to the waiting net before being netted at both ends with large landing nets. The gigantic Arapaima was estimated to weigh 150kg’s and was proudly held aloft by the captors. 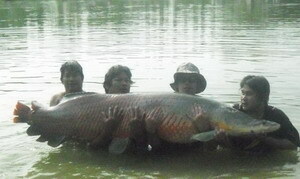 A barrage of trophy shots were taken before the Arapaima was carefully slipped back into the lake.